An orphaned young yōkai-fox (kitsune) whose father was killed by the Thunder Brothers, Hiten and Manten. He wanted to avenge his father so he helped Kagome and Inuyasha. He was the first character in the story to join InuYasha and Kagome in their travels as a group. Shippo can shape shift, but his forms are temporary, often incomplete and ineffective, and he is usually given away by his telltale tail. His other noteworthy abilities are turning into a wooden horse that can fly, leaving a trail of yelping mushrooms and acorns, illusionary tricks with toys like his giant spinning top attack, using his race's notable fox fire magic (which rarely seems to work properly), and making things like leaves or himself multiply. He tends to be naively observant and often makes pointed and cheeky comments directed towards InuYasha, earning him a retaliatory bonk on the head for his unnecessary "advice". InuYasha and Kagome serve as older sibling figures to Shippo. 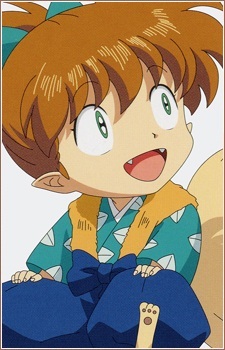 Shippo and Kirara (when she is in her kitten form) are the smallest members of InuYasha's group, with Shippo being the youngest. Because he so small and light, whenever the group is traveling anywhere Shippo is almost always seen riding on someone's shoulder, on Kirara's back, in Kagome's arms, or in the basket on Kagome's bike; he is rarely seen walking or running.